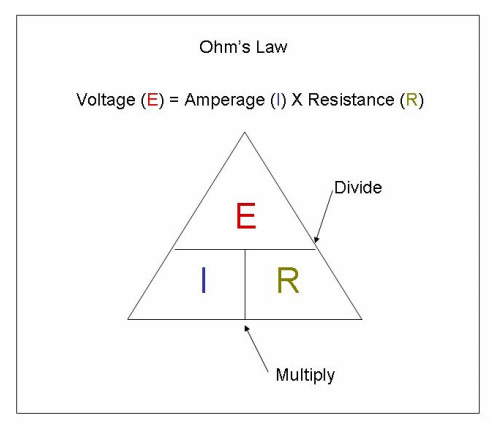 Description: In order to understand Ohm’s Law, it is necessary to have a good definition of voltage, amperage, and resistance. Voltage is defined as the push or force used to move the electrical charges. 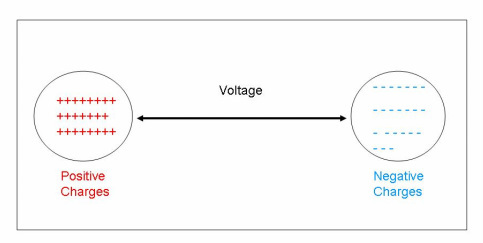 Referring to the illustration to the left, the difference between the positive and negative charges is called voltage. This difference in charges has the ability to move electrons and positive charges through the wire. Voltage in an electrical circuit is analogous to the water pressure in a pipe, which causes water to flow. Other terms are also used to describe voltage. They include potential difference, electromotive force or emf, and electrical pressure. Voltage is represented by the letter E, with stands for electromotive force. It is measured in a unit called volts. In some instances, voltage may also be represented by the letter V.
Amperage is defined as the amount of electrons flowing in the circuit for a given period of time. Amperage or current is analogous to water flowing through a pipe (electrons flowing through a wire). One ampere is equal to 6.28 billion, billion electrons passing a given point in one second. The letter used to identify amperage, or current, is I. This stands for the word intensity of current flow. Note that amperage may also be identified by the letter A. Resistance is defined as the opposition to the current flow. Because of their atomic structure, certain materials offer poor conductivity. This will slow down the movement of the electrical charges. Actually, as the electrons move through a resistor, they bump into other atoms in the conductor. As this occurs, the material heats up and causes even more resistance. Resistors are designed to control the flow of electrons and therefore the flow of electrical charges. Often the resistor is said to be the electrical load. Resistance is defined by the letter R which stands for resistance to electron flow. It is measured in units called ohms. To compare resistance to a water circuit, flow valves and faucets control or restrict water flow. So resistance in an electrical circuit controls or restricts electron flow. These three electrical components interact with each other. For example if the resistance decreases and the voltage remains the same, the amperage will increase. If the resistance stays the same and the voltage increases, the amperage will increase. Relationship to Street Rods: In a street rod, the voltage will remain at 12 volts as determined by the battery voltage. So the amperage in any circuit will be set or determined by the resistance. If a street rod circuit had a 10 amp fuse in the fuse panel, and the fuse continually broke open, this would mean that the resistance in the circuit was too low and not able to control the amperage to 10 amps. This might indicate that the circuit was shorted past the resistor, reducing the resistance, and increasing the amperage above the 10 amp limit. This in turn, would cause the fuse to continually break open.